Please click here or on image for a medium-size view (35%). Please click here for a larger-size view (45%). 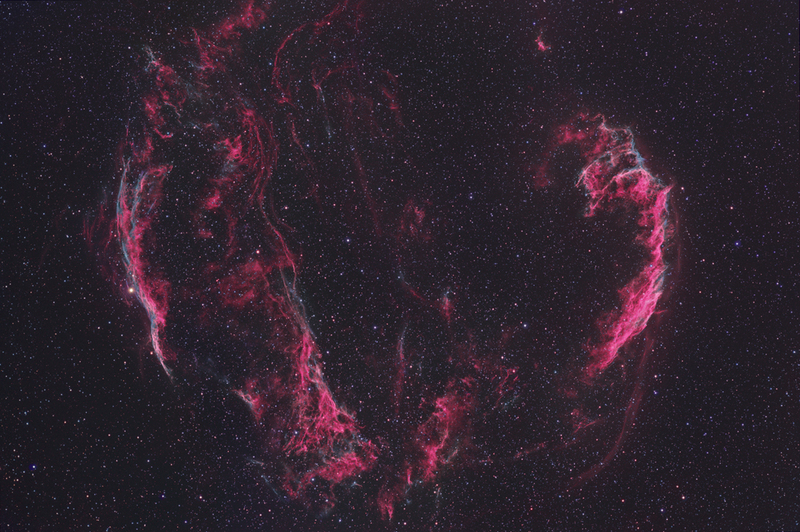 The famous Cygnus Loop, also known as the Veil Nebula Complex, is shown above in this 8 hour image consisting of Ha, OIII, and RGB data collected over 5 nights. The loop is created by an expanding shockwave resulting from a supernova that exploded approximately 8,000 years ago. The shockwave slams into surrounding dust in the interstellar medium, ionizing gases such as hydrogen, oxygen, and sulfur, which emit specific wavelengths of radiation during electron recapture. Thus, in the above image you can see radiation from singly ionized hydrogen (HII, Hydrogen Alpha, 656.3 nm, shown in red) as well as doubly ionized oxygen (OIII, 496nm and 501nm, shown in teal). The result is a beautiful, lacelike structure that has fascinated astronomers since its original discovery in 1784 by William Herschel. Parts of the Cygnus Loop visible in the above image include the Eastern Veil (NGC 6992) on the right, the Western Veil (Witch's Broom) Nebula (NGC 6960) on the left, and Fleming's Triangular Wisp (Pickering's Triangle). The filamentous structure of the nebula, seen in exquisite detail in this image from the Hubble Space Telescope, results from the fact that we are viewing the thin shockwave fronts edge-on. Note that more stars can be seen within the central portions of the image, whereas the peripheral regions (especially to the left of the Western Veil) show less stars. This is due to the fact that radiation from the supernova explosion has cleared out dust within the center of the nebula, making background stars more visible, whereas areas outside of the nebula are still relatively obscured by a higher concentration of dust in the interstellar medium. A supernova results from a massive star (at least 8 solar masses) that has used up most of its elements through fusion, converting hydrogen to helium, oxygen, silicon, sulfur, calcium, gold, and eventually iron. Iron is not a viable fuel for fusion (it requires too much energy), meaning that this element represents the end of the line for a dying star. Without the outward force of fusion-induced radiation, the star collapses under its own gravity, resulting in a massive explosion and release of radiation, some of which we see as visible light. Based upon the current rate of expansion of the Cygnus Loop, and accounting for the expected slowing of this expansion rate over time as the shockwave interacts with the interstellar medium, the supernova explosion that created this nebula is estimated to have occurred around 8,000 years ago, just before the beginning of recorded human history. Those humans gazing upwards at the time must have seen the sudden appearance of a very bright "star" that waned in intensity over several weeks to months. The stellar remnant of a supernova explosion is a neutron star or a black hole (depending upon the size of the residual star). If the residual star is between 1.44 and 3 solar masses, it forms a neutron star. If it is greater than 3 solar masses, it forms a black hole. Whether a neutron star or a black hole, the remnant of the supernova explosion that created the Cygnus Loop has not yet been identified. The bright star overlying the Western Veil (left hand side of the image) is 52 Cygni, a foreground star that is not related to the nebula. Controversy existed for many years regarding the distance to this nebula, which was originally thought to be in the range of 2,500 light years. More recent data using the Far Ultraviolet Spectroscopic Explorer (FUSE) has identified a star (KPD2055+311) that emits strongly in UV light, located behind the Cygnus Loop at a distance of 1860 light years. Thus, 1860 light years represents an upper limit to the distance of the Cygnus Loop. This supports data from Blair et al using the Hubble Telescope, which placed the Cygnus Loop at a distance of 1470 light years, now accepted as the most reliable estimate. Additional information about this interesting region may be found here. Scope: Takahashi FSQ106 at f5 on the G11 Losmandy Mount. Autoguider: SBIG ST-402 with e-finder. Filters: Baader 7 nm Ha filter; Baader 8.5 nm OIII filter; Astronomik RGB filters. Exposures: Ha, 9 x 20'; OIII, 8 x 15'; R, 9 x 5'; G, 9 x 5'; B, 12 x 8' (all unbinned, image scale 3.5"/pixel). Total exposure 8 hours. Post-processing: Calibrated, astrometric aligned, and Sigma Clip combined in Maxim, followed by DDP in ImagesPlus (IP). Further processing in Photoshop CS (16 bit format). For the color channels, the RGB was processed first, and the narrowband data were then integrated into the RGB as follows: Ha was combined with R at 100% using lighten mode, Ha was combined with B at 20% using lighten mode, OIII was combined with B at 100% using lighten mode, and OIII was combined with G at 35% using lighten mode. A star mask was used to avoid "contaminating" the RGB star color data with narrowband data during this process. This method is empiric but recognizes that fact that hydrogen signal is not only derived from H alpha (656.3 nm, red) but also from H beta (486 nm, bluish). It also recognizes that the OIII signal is a mixture of blue and green, representing the 496 nm and 501 nm wavelengths. I purposefully chose to weigh the OIII signal more heavily in the blue, based upon a personal preference, although you can clearly detect a touch of green in the OIII regions of my image. After constructing this "narrowband-boosted" RGB layer, the Ha and OIII layers were used as luminance (35-50% opacity) to provide extra detail in the filamentous regions.